The Classic Trail or Four-Day Trek begins from one of two points, Km 88 or Km 82, on the Urubamba River not far from the village of Ollantaytambo in the Sacred Valley. Km 88 and Km 82 are check points along Peru Rail's railroad tracks to Machu Picchu and refer to the distance from the City of Cusco. The first hiking day is relatively easy, usually covering no more than 12 km in an afternoon. During the first day and a half, hikers will encounter native campesinos who speak Quechua and actually live inside the Machu Picchu Sanctuary along the first part of the Inca Trail. However, once hikers begin their steep ascent to cross Warmiwañusca Pass, they will no longer see any locals for the remainder of their hike. 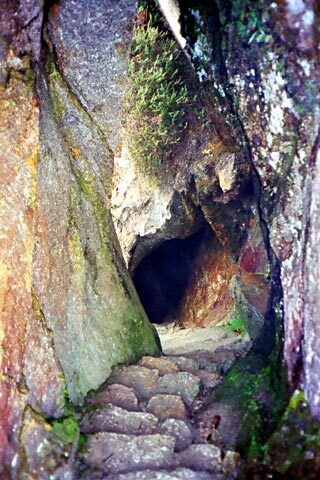 In addition, the trail becomes more pristine and the paved stones upon which hikers travel were placed there by the ancient Incas. The Classic Camino Inca begins at either Km 88 (Qoriwayrachina) or Km 82 (Pisqakucho). In addition to being the trailhead for the Inca Trail, Km 88 is also the site of the ruins of Qoriwayrachina which are located near the Urubamba River. Most hikers do not enter Qoriwayrachina to explore it. However, there are unique stone sculptures and altars present at Qoriwayrachina, making it well worth the effort to explore and hikers should be ready with their cameras, taking photos and uploading them in their ipods for sharing with their family and friends back home. The next archaeological site encountered on the trail are the ruins of Llactapata, a site that is thought to have been used primarily used for crop production. Llactapata is very well preserved and is located at 9,318 feet (2,840 m) above sea level. Its name means "High Town" in Quechua. The Llactapata Ruins on the Classic Inca Trail should not be confused with the ruins of the same name located west of Machu Picchu that are observable on the Salkantay Alternate Trek. 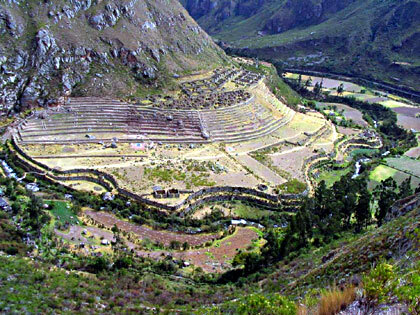 Recent studies of the Llactapata Ruins located on the Salkantary Trek indicate that the settlement was positioned, designed and functioned as a sacred center similar to Machu Picchu, while the Llactapata Ruins on the Classic Inca Trail were more agricultural in function. 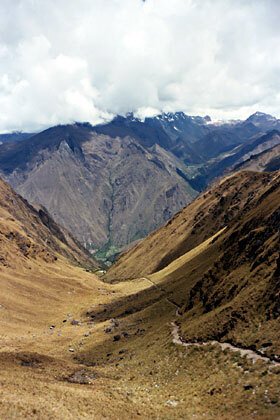 Sadly, few trekkers leave the Classic Inca Trail to visit the ruins that are located far below the trail. The second day includes an ascent to Warmiwañusca or Warmihuañusca ("Dead Woman's Pass"), which, at 13,800 ft (4,215 m) above sea level, is the highest elevation on the Classic Inca Trail. Most groups camp the second night 600 m below Dead Woman's Pass on the other side of the pass at Pacaymayu. The third day begins with the ascent of yet another pass (Runcurakay Pass at 12,631 ft). The views from the top of the passes provide incredible vistas of nearby mountains such as Veronika and Salkantay. The first ruins encountered is a circular, walled complex with typical Incan niches inside. This beautiful Incan ruin is called Runkuracay ("Pile of Ruins") and is located at 12,139 feet (3.720 M) of elevation. 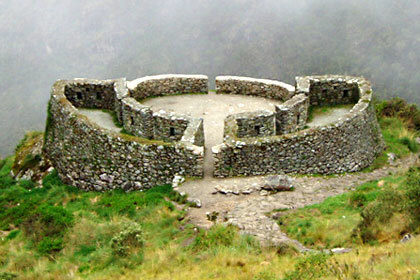 The circular ruin is thought by archaeologists to have been a "tambo" which was a resting station for couriers traveling along the Inca Trail to Machu Picchu. Runkuracay contains an area for sleeping and a stable area for their pack animals (generally llamas). After Runcurakay Pass is the site of Sayacmarca ("Dominant Town"), which sits on top of a sheer cliff. After Sayacmarca, the vegetation along the Inca Trail begins to change as it proceeds through a tropical cloud forest that is actually part of the Amazon jungle, filled with exotic flowers and colorful orchids. After Sayacmarca ruins, trekkers encounter the beautiful ruins of Phuyupatamarca, which is thought to have been an important religious site containing numerous baths for religious ceremonies. Incredibly, the majority of the Inca Trail, especially that encountered on the last two days, is of original Incan construction. One interesting feature is the incredible engineering that went into the original Inca Trail construction. The Trail actually passes through mountains using a system of tunnels. The tunnels are truly an engineering feat that illustrate the effort that went into the construction of the trail. To think that this paved trail has survived over 500 years is a tribute to those Incan engineer and workers that planned and completed this remarkable trail. The third day ends with the Incan ruins of Intipata and Wiñay Wayna ("Forever Young"). Near Wiñay Wayna there is a remarkable museum and garden where visitors can learn about the fauna and flora of the Camino Inca. In particular, there is a wonderful collection of orchids in the garden. This area has one of the greatest varieties of native orchids found any place in the world. The final day (Day 4) begins near the ruins of Wiñay Wayna ("Forever Young"), an important and well-preserved Inca ruin. This is where the Two-Day Trek meets up with the main Four-Day Trek. The final leg of the trek involves climbing to the vista of Inti Punku, the 'Sun Gate' where hikers can finally see their destination in the distance, the ruins of Machu Picchu. From here, it is an easy and enjoyable hike to one of the wonders of the world, Machu Picchu.